The next day Thursday 25th of June, The seers had gone to work as normal in the tobacco fields. They decided after work to take a walk in the direction of Mount Podbrodo, and if they saw the same apparition, all well and good. If they did not, they would not talk about it. People were starting to laugh at them and their suggestion of visions. When they set off a couple of children had joined them as well as a few adults, when they arrived at the spot Ivanka saw the vision of Our Lady as did Vicka, who ran off to tell Marija Pavlovic and ten year old Jakov Colo whom they had promised to inform if she appeared again. The vision on the hill beckoned them to come forward as the seers ran forward their flight appeared exceedingly fast, considering the treacherous rocks and prickly bushes, Vicka was also barefoot but she was also unscathed. When they arrived by her side they all fell to their knees including Jakov who fell on a thorny bush, but was without a scratch. Marija could only see a white blur but finally she saw Our Lady, as did Jakov. The most striking feature it is said of Our Lady is her eyes, which are supposed to be incredible light blue. The first person to speak to Our Lady was Ivanka who had lost her mother two months prior. Our Lady told her that her mother was fine and do not worry. People in general were pleased to hear this news, as her mother was not particularly a religious woman, although a good mother. It showed one does not to have to be a saint to go to heaven. It was Mirjana next who wanted some kind of a little miracle to quell the folk in the village from there joking. But Our Lady gently smiled at her, and nothing more. There were prayers said on this day and a few tears. The only little miracle was when Vicka asked Mirjana what time it was, to which Mirjana responded three fifteen. Vicka replied what do you mean three fifteen; you must have set the time wrong. What in fact had happened was the number 12 on her watch had strangely changed into number 9. As far as we know Mirjana still has that watch to this day. While they prayed Our Lady joined them although she did not join in, on the Hail Mary. On this day Our Lady asked them to join a creed to the prayers. She was there for approximately fifteen minutes and then rose in the air, and the children watched as she departed. Noticeable to the seers and apparently to some of the village folk who looked up at the hill of mount Podbrodo. Three flashes of light rather like lightning precede Our lady?s apparition. In conclusion the six seers of Medjugorje are, Ivanka Ivankovic, Ivan Dragicevic a Jakov Colo, Mirjana Dragicevic Marija Pavlovic, Vicka Ivankovic. The pastor at the time of these apparitions was Father Jozo Zovko, but he was in Zagreb at the time of the apparitions. So a neighbor by the name of Marinko Ivankovic made it his concern for the welfare of these young people and told Father Zrinko Cuvalo, about his concerns, and what they had claimed to have seen, and that they were in need of help. In the early days it was Marinko who was the support for these young people. Vicka father was working away. Ivanka had just lost her mum, and her dad worked in Germany. Jakov seldom saw his father. who worked in Bosnia. 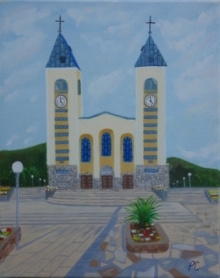 Mirjana was spending the summer in Medjugorje with her grandmother. While her parents lived in Sarajevo. All records of events were confiscated by the police on August 17th 1981..... Marinko however had kept records of all the events from the beginning?